Charlottesville and nearly all of Albemarle County are within the James River watershed. 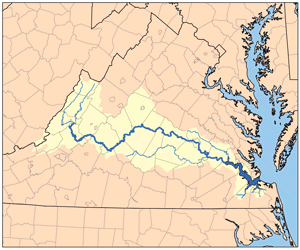 The James River forms the southern border of Albemarle County with Buckingham County, and the watershed boundary forms the northwestern border of Albemarle with Augusta County. Virginia Route 20 crosses the James at Scottsville. This page was last edited on 6 April 2012, at 20:53.